8 × five = Required Please enter the correct value. U.S. Senator Bernie Sanders (I-VT) speaks at a presidential campaign rally in Madison, Wis. before a crowd of over 10,000 people on July 1, 2015. He earned an annual income of $174,000 in 2014, and has a net worth of $528,014 as of August 2015. That makes Bernie Sanders' net worth 230 times smaller than that of his Democratic opponent and former Secretary of State Hillary Clinton, according to an August 2015 Money Nation article. The average U.S. Senator has a net worth of $10,866,000, according to OpenSecrets.org. Out of 100 U.S. Senators, Bernie Sanders' net worth ranks at No. 86. This puts Sanders below the average of his fellow congressmen. Sanders' combined salary comes solely from his career in politics – which he's been at for 44 years and counting. He was once the mayor of Burlington, Vt. In addition to the U.S. Senate, he's also held positions in the U.S. House of Representatives. Money Nation: What Is Bernie Sanders' Net Worth? "We’ve got to demilitarize the police — we don’t need tanks, you don’t need heavy military equipment in the communities of the United States. We gotta pay attention to the African-American communities, to poverty so these kids get the education and job training they need," Sanders told Yahoo. "What I can tell you is this: We have far, far, far too many people in jail for nonviolent crimes, and I think in many ways, the war against drugs has not been successful, and I think we've got to rethink that," Sanders told Yahoo News' Katie Couric. "Folks who do not like guns [are] fine. But we have millions of people who are gun owners in this country — 99.9 percent of those people obey the law. I want to see real, serious debate and action on guns, but it is not going to take place if we simply have extreme positions on both sides. I think I can bring us to the middle," Sanders said in a CNN interview. "Our goal as a nation is that if somebody works 40 hours a week, that person will not be living in poverty," Sanders said in Iowa. "We got to put young people to work, we got to give them an education, rather than putting them in jail," Sanders said in an interview on MSNBC's "The Ed Show." 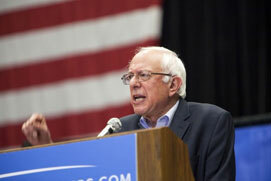 "If a bank is too big to fail, that bank is too big to exist," Sanders said in Denver, Colorado. "A major problem of our campaign finance system is that anybody can start a super PAC on behalf of anybody and can say anything. And this is what makes our current campaign finance situation totally absurd," Sanders said to the Burlington Free Press. "In the last 30 years there has been a massive — we’re talking about many trillions of dollars being redistributed from the middle class to the top one-tenth of 1 percent. It is time to redistribute money back to the working families of this country from the top one-tenth of 1 percent," Sanders said on PBS's "Charlie Rose." "It is insane and counter-productive to the best interests of our country, that hundreds of thousands of bright young people cannot afford to go to college, and that millions of others leave school with a mountain of debt that burdens them for decades. That must end," Sanders said during his campaign announcement.